Haven’t you heard? Gluten-free is so hot right now. No, I am not gluten-free. I’m just not hip enough to align myself with Victoria Beckham, Zooey Deschanel, Rachel Weisz, and a whole host of Hollywood glitterati. 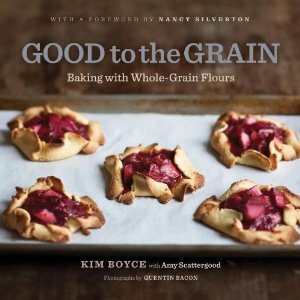 Rather, I got a whole lotta love for coconut and alternative flours of all-stars and stripes (thank you, Kim Boyce!) My coconut lovin’ kicked into overdrive after a family vacation to sunny Puerto Rico, where coconut is practically the national emblem. Street vendors sell endless varieties of shockingly sweet coconut candies while coconut water, the health craze du jour of the moment, is readily available on most street corners where it is epically served to you by a man with a machete, who lobs off the top of a coconut for you, jams a straw through its spongy flesh, and hands you what must be a gallon of coconut water for a mere dollar or so. 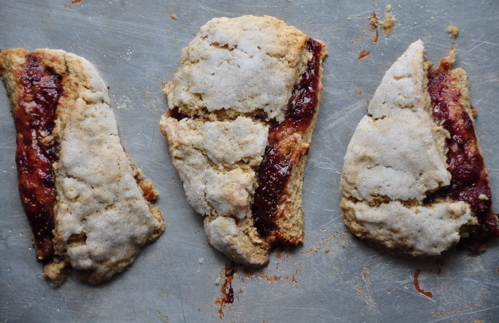 With a surplus of barley flour haunting the shadowy recesses of my freezer (Kim Boyce’s fabulous Strawberry Barley Scones from Good to the Grain, prompted me to order a whole box of it) I figured it was about time to clear house, what with spring allegedly right around the corner. I was making a divine Smoky Carrot Hummus for dinner and, seeking out a vessel for the aromatic spread, was decidedly uninspired by the “homemade whole wheat bread” at the grocery store that listed upwards of 10 ingredients. 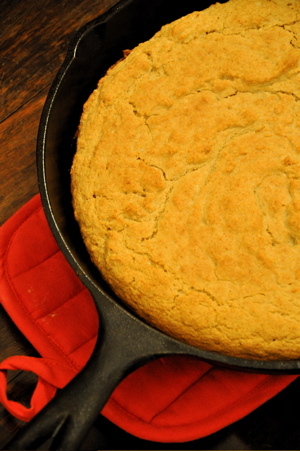 Lacking both the time and willpower to bake a traditional loaf of rise/knead/repeat bread, that’s when the idea for a quickie skillet bread bubbled up from the depths of my food subconscious. Done in 40 minutes or less. YES. “New year, new you” blah blah blah. Amongst my circle, cutting down on white sugar is by far the most unanimous resolution. However, if you’re like me, there is no way in hell that you’re cutting out sweets. Not only do I advise against cutting out sweets for countless emotional and psychological reasons, but also for physical ones. They say withdrawal is a terrible thing… so WHY go cold turkey when you can whip up a batch of these delightful little bundles of joy? 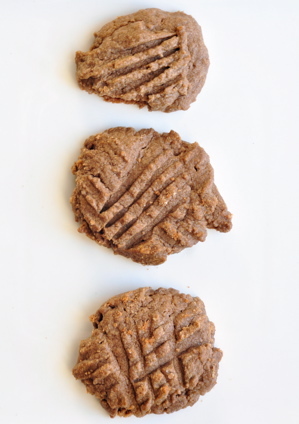 Made with teff flour, a veritable nutritional powerhouse from Ethiopia full of fiber, protein and iron and sweetened with maple syrup, these cookies are rather righteous. Oh, and they’re vegan to boot. For those that love the reassuring ritual of a muffin in the morning, but are feeling rather virtuous. 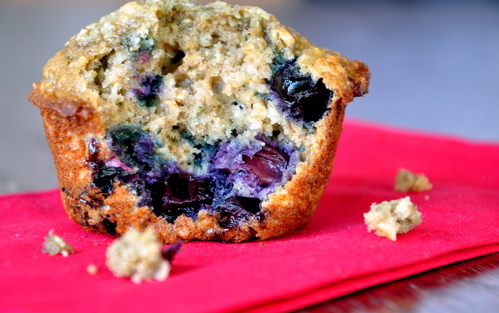 Loaded with oats, whole wheat, and berries, but still sufficiently sweet. Samoa. Yes, SAMOA, everyone’s favorite Girl Scout cookie. The box that disappeared waaaay before the thin mints were even opened. To counteract the naughtiness, the crust is whole wheat pastry flour (a bit o’ fiber here, a bit o’ fiber there.) 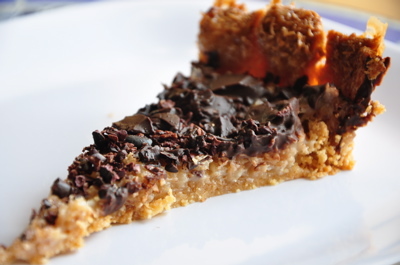 Chocolate, caramel, and coconut – oh yes! It can be eaten soon after cooling, or may even be better after being refrigerated overnight, as the goopiness sets to create a more cohesive tart experience. 1.) To make the crust, whisk together the flour, sugar, and salt in a large bow. Add the cubed butter and use a pastry cutter, fork, or even your fingers to break up the butter into small pieces the size of peas. Add the vanilla and water, as needed, until the dough just barely comes together. It will be very dry. Press into a disk, wrap in plastic, and chill thoroughly; at least an hour. Remove and allow the dough to come back to room temperature. 2.) Grease bottom of a 9-10 inch tart pan and then line the bottom with parchment paper. Unwrap dough and, using the palms of your hands and whole lot of elbow grease, press and press and PRESS that dough out as thinly as your can, around the bottom of the pan, and up its hilly sides with your fingers. If you press a hole into the dough, not to worry, just patch it up with a bit of the overhang. Place in the freezer and chill thoroughly; at least an hour. 3.) Preheat oven to 375 degrees. Remove crust from freezer and bake for 20-30 minutes; until lightly browned. While crust is baking, make the filling. 4.) Heat the cream, sugar, and salt in a heavy sauce pan over medium-high heat until it begins to boil. When it begins to foam and rise up, remove from heat, and stir in the coconut and vanilla. Scrape filling into the prepared crust. 5.) Bake for 10 minutes, then use a heat-proof spatula or the like to lightly tap all around the surface to break up any caramelization/setting that is occurring. This helps the tart to bake evenly and prevents it from wrinkling up. Bake for another 10 minutes, tap again, and then bake for a final 10 minutes or so for a total baking time of about 30 minutes. 6.) Remove from the oven, place on a cooling rack, and immediately sprinkle those lovely little nibs all around the tart’s surface. 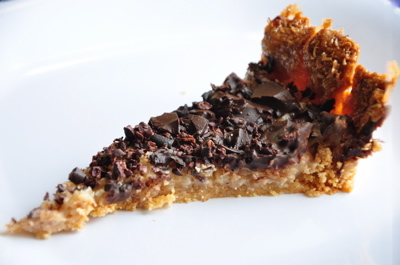 Wait a minute or so, and then sprinkle the chopped up chocolate bar across the tart. When completely cooled, remove the tart ring gently. Don’t even think about whipped cream. I know I’ve become a bit repetitive with my endless adoration of Good to the Grain (yeah, I know, I’ve jumped on the bandwagon) but isn’t that an indication that it is, indeed, time to add it to your cookbook library if you haven’t already? 8 oz high-quality bittersweet chocolate, roughly chopped to the size of your liking! 1.) Place one rack in the upper third of the oven and the other in the bottom third. Preheat oven to 350 degrees. Line two heavy baking sheets with parchment paper. 2.) In a large bowl, beat butter and sugars with an electric mixer until blended; 2 minutes or so. Add eggs one at a time and beat after each addition. Use your spatula to scrape down the sides of the bowl throughout. Mix in vanilla. 3.) Sift flour, baking powder, baking soda, and salt directly into the bowl with the wet ingredients. Blend until just combined. 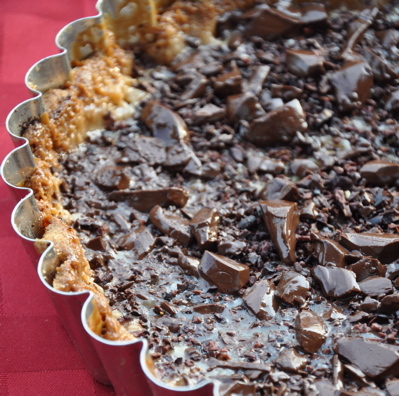 Add chocolate and use your hands to evenly disperse. 4.) Using an ice cream scoop spoon little mountains of dough, approximately 3 tablespoons in size, onto the baking sheets. Leave a few inches between each mountain. Bake for 15-20 minutes, swapping the top tray with the bottom tray halfway through. 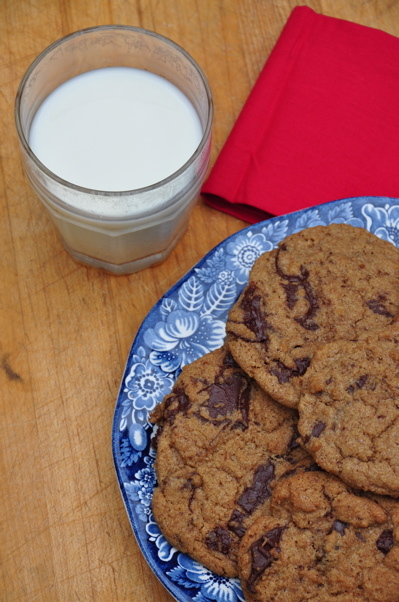 The cookies are done when they are lightly browned and the edges are beginning to set. 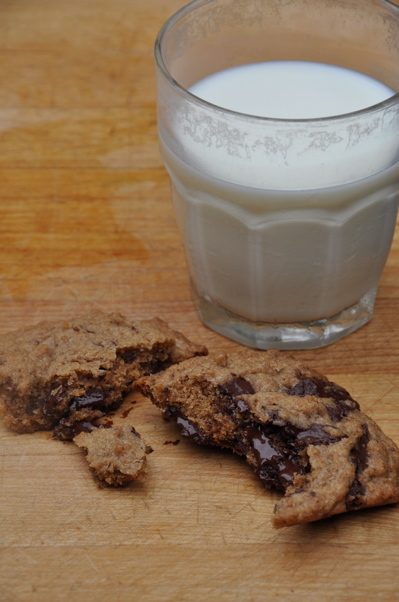 The cookies will still be very, very soft and gooey when they’re done, and you will have to be careful when moving to a cooling rack. It is essential to not overbake these – resist the temptation to bake them longer than 20 minutes.